Here in America, the annual college hoop-fest known as March Madness has reduced the initial field of about a million and a half to the Sweet Sixteen, which will then become the Elite Eight, and then next week the Final Four and, at long, last the Championship Game. During tournament season, Americans match wits against co-workers, relatives, and basketball experts, as they predict how things will unfold. But the idea of competitive brackets has spread far beyond basketball. Several years ago, my son, inspired by Purim, came up with seedings for an imaginary tournament involving 64 classic anti-Semites. His ultimate “winner” was Voldemort, in a tight contest over Haman and Pharaoh (Hitler was banned from the tourney). Whether or not Voldemort was actually anti-Semitic didn’t matter. The kid was 12 and loved Harry Potter so much that he figured Potter had to be Jewish, which automatically made Voldemort an anti-Semite. 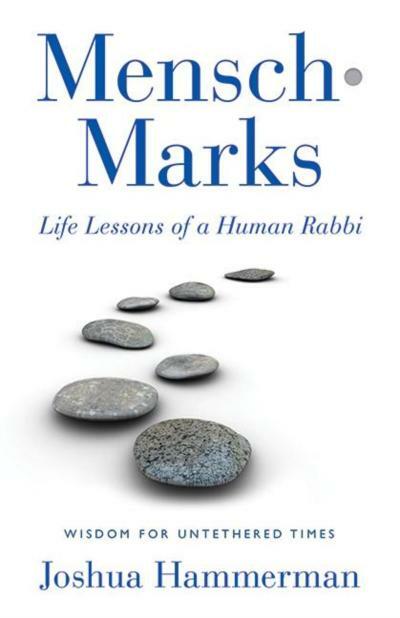 So as my book Mensch-Marks: Life Lessons of a Human Rabbi hits the shelves next week, I thought I’d toss out my Sweet Sixteen finalists for top mensch of all time. My ground rules are that a mensch does not have to be a man, nor does s/he have to be Jewish. I’ve removed God from contention, along with supremely venerated figures like Moses, Jesus, Muhammad, Buddha, Confucius or Krishna, in order to make this a fair fight. I’ve also taken out Anne Frank, because how could anyone ever vote against Anne Frank, and Barbra Streisand’s eligibility has been revoked, pending further retractions of her Michael Jackson comments. Of course you are free to quibble with my choices. One glaring omission here is that -person-who-has-made-the-greatest-difference-in-your-life-but-no-one-else- knows. Your grandmother could well be your number one seed. Also, just the Atlantic Coast Conference dominates the college basketball seedings, the Holocaust yielded fully a quarter of the finalists in my bracket, topping even the Bible. The match-ups for this round are intriguing. 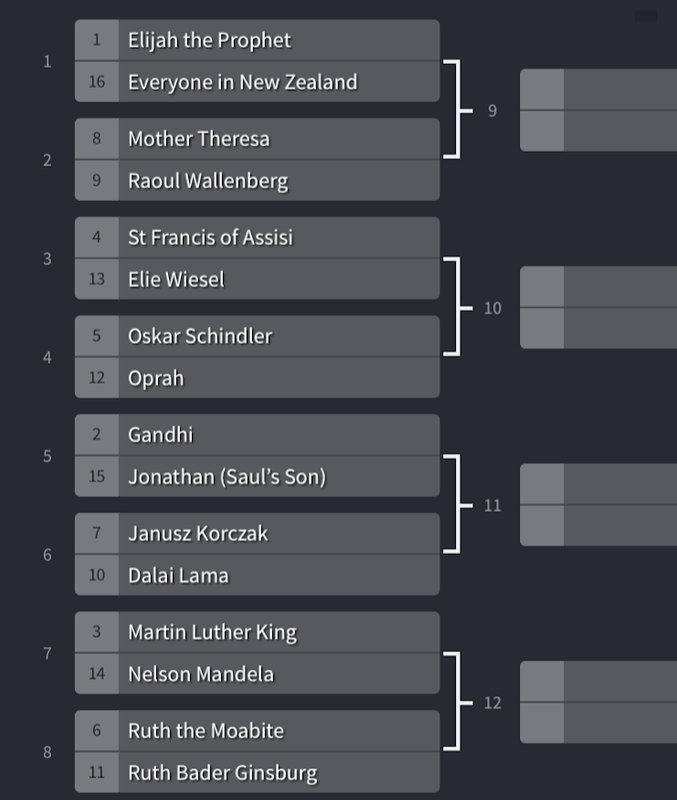 We’ve got Ruth v Ruth, Oprah against Oskar and Mr. “Brother Sun, Sister Moon” against Mr. “Night,” “Dawn” and “Day.” The Elite Eight could offer a titanic battle between Elijah and Mother Theresa, two champions of the poor and hopeless, and MLK vs. RBG would be the greatest all-time acronym battle since Rashi and Rambam squared off in the Commentator’s Super Bowl. So how does one determine who is menschier? There are lots of ways to judge, because menschiness involves a plethora of positive character traits. 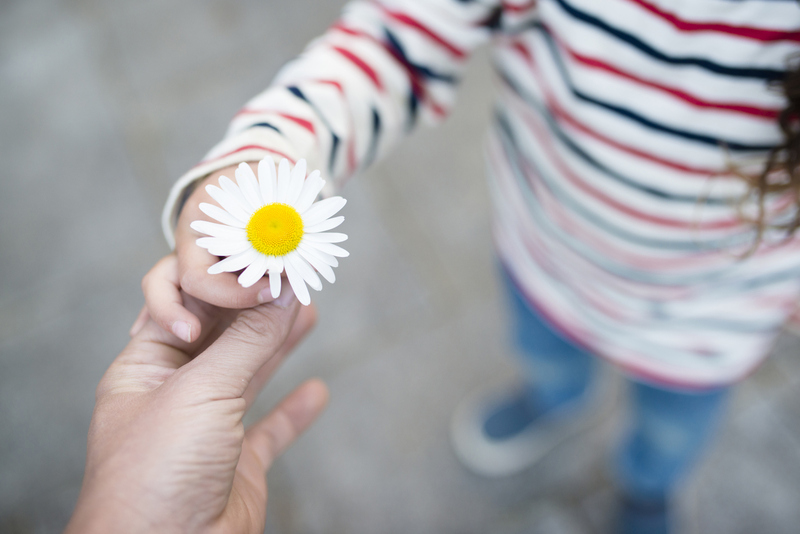 Leo Rosten defines a mensch as “someone to admire and emulate, someone of noble character.” Dr. Saul Levine writes in Psychology Today that a mensch’s personality characteristics include decency, wisdom, kindness, honesty, trustworthiness, respect, benevolence, compassion, and altruism. But neither Levine nor Rosten do the term justice. It is said that Eskimos have 50 words for snow. Well, Jews have a single word that embodies at least 50 divinely inspired character traits, including optimism, curiosity, forgiveness, kindness, creativity, gratitude, discipline, enthusiasm, principle, perspective, love of learning, humor, bravery, teamwork, civility, social conscience, and perseverance. Put that package together and you’ve got an exemplary person, but you do not need to be a saint to be a mensch. To be a mensch in fact means to be fallible and imperfect, but always striving to do better. To be a mensch means having to say you’re sorry. It means owning failure. It also means seeking justice, but never at the expense of compassion. It means connecting: to family, to one’s people and one’s home; seeking transcendence, seeing the extraordinary in the ordinary, loving unconditionally and living with integrity and humility. We are seeing an alarming rise in anti-Semitism and hate speech, on the right and on the left. Our social environment has become increasingly toxic. The problem is not simply a matter of a swampy White House (or Knesset) that has made a mockery of honesty and practically criminalized remorse. We are witnessing a perfect storm, where corruption in government has merged with the concurrent breakdown in the moral authority of religious institutions. Into this tempest, I toss out “mensch” as a life preserver, one that not only can save society, but also reinvigorate the Jewish people. With so many young Jews fleeing “religion,” they need to know that being a mensch is the essence of the Jewish message and that the key to Jewish spirituality is the incorporation of divine compassion into our lives. When someone tells me before a funeral, “He was a good person but not a good Jew,” I reply that to be a good person — a mensch — is to be a good Jew. I also hope to lift the term from its permanent abode at funerals and bar mitzvahs and the cutesy-wootsy nostalgic images of bearded Tevye-like creatures like the “Mensch on a Bench.” We need a mensch that plays in Peoria, not just in Jackie Mason monologues. We need real moral heroes during these untethered times. My projected Mensch Madness winner? Elijah. Who else could pull off his trifecta of messianic harbinger, Havdalah houseguest and Passover drinking buddy — and also manage to attend millions of brisses without once losing his lunch? At first I tried to change the world and failed. Then I tried to change my city and failed. Then I tried to change my family and failed. Finally, I tried to change myself and then I was able to change the world. With the publication of Mensch-Marks I’m hoping to inspire a Million Mensch March. To enlist, you don’t need to head to the Lincoln Memorial or Rabin Square with a protest sign. All you need to do is act with a little more kindness, honesty, decency, civility, principle, justice and love. We can change the world, one mensch at a time. Dual loyalty — or dual love? Shabbat-O-Gram: Dual Loyalty - or Dual Love?